I created this beautiful and delicious green bean dish tonight for dinner and served it with the Chick'n Salad Sandwich (Post Below). The fresh, tender green beans were sooo....good. You have to give this one a try. You could serve this at any holiday meal as well. 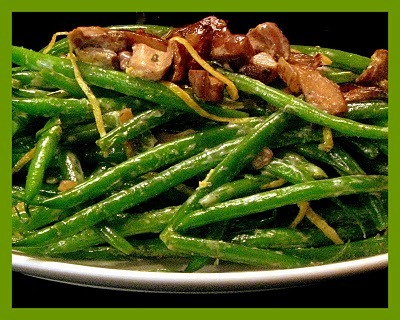 This looks really REALLY delicious, and such a fun and new way to have green beans as a side! Ok, we will have to have this on our Thanksgiving menu this year for SURE!!!!! Morgan, we will definately serve this at Thanksgiving. It is sooo....delicious! You have to give this one a try. Looks sooooo yummy, and your picture looks awesome! The long strands of lemon peel are so beautiful! Thank you Jennifer, Elise & Shen for your nice comments:) I just ate the leftovers from yesterday and it was DELICIOUS ALL OVER AGAIN!! This dish is heavenly and satisfying. I hope you will try it and let me know what you think.